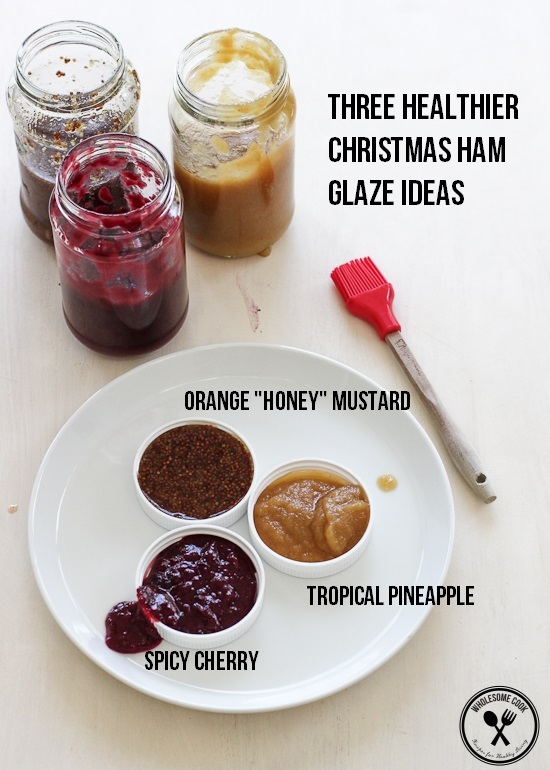 Made with whole fruit and a good measure of festive spices, these Christmas Ham Glaze Ideas – in Spicy Cherry, Tropical Pineapple and Orange Honey Mustard are delicious, added sugar-free, quick to make and perfect for gifting. This year, and for the first time in our adult lives together, we will be hosting Christmas at our place. The tree has been decorated. Extra place settings and sheets bought. I even managed to save time by getting my oven cleaned by the very efficient team from Oven Express. I’m not sure why I’d ever bothered doing it myself. They took on the elbow-grease end of the job, one that no one particularly likes, while I planned the menu. Words cannot describe how excited I am to be doing this. It’s been a huge year for us and to be able to share the memories of the 12 months gone by with family will be a true blessing. …of doing those grown up things like getting engaged, buying a house and getting married. We spent an amazing three weeks in France, Spain, Warsaw and London, dining at the world’s no 4, no 7 and no 8 best restaurants, enjoying the sights, languages, people and culture. I’ve also completed my studies and graduated from the Institute for Integrative Nutrition. The course had such a great holistic depth to it that celebrated bioindividuality – you know, the fact that we are all different and no single way of nourishing our bodies is best for everyone. Finally someone talking and teaching sense! If you are passionate about health and wellbeing and have considered doing a nutrition course, you should take the leap in 2014 sign up. Or at least get the IIN starter guide. read it over the holidays and feel inspired. 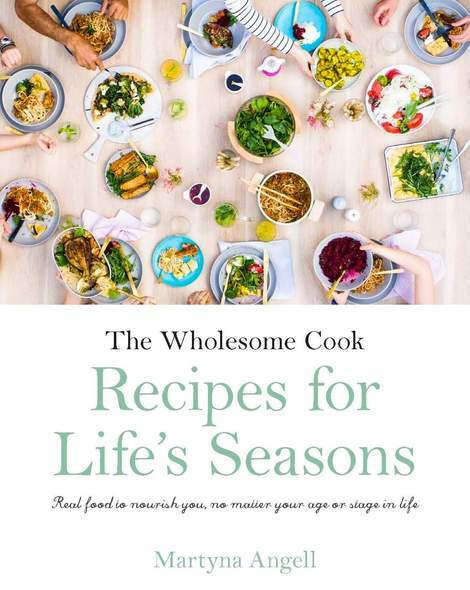 2013 was a year of success for Wholesome Cook, too. I was shortlisted as a top 5 finalist in the inaugural BUPA Health Influencer Awards – this was a great honour. I’ve developed and shot recipes for my favourite clients. I’ve had the great pleasure to work as a recipe developer, stylist and photographer for Sarah Wilson’s Online I Quit Sugar Program. I was one of the ambassadors of the Meat Free Week 2013 Campaign (and will be back in 2014). I’ve developed recipes for cookbooks and contributed my first edtorial piece to a national food magazine which will be out in time for Easter. I’ve styled and shot a kids eCookbook and am working on Quick and Healthy Smoothies, my third big eBook. I won the Nespresso Brownie Competition and I’ve come third and second in a Sydney-based food blog ranking. In February, I had my 1 millionth page view. It looks like by the end of the month, that will be 2 million! And this will be my first time making a whole glazed leg ham. So I’ve been practicing and perfecting glazes for the past month on smaller pieces of ham and pork loin. These are quite perfect for smaller gatherings actually. I think Spicy Cherry might be my favourite, closely followed by the Tropical Pineapple… Mmmm! Now, as Christmas is only a handful of days away, I am going to put my feet up for a couple of days and take a breather. Realx. Read a few books. See a movie. Go for a swim. Wrap gifts. Maybe even get the barbecue cleaned… you know, by OvenExpress, so that I have more time to plan for the year ahead and thank you. For sticking around, reading, commenting, enouraging me on, emailing questions, criticisms and praise. From the bottom of my heart, I want to wish you a very happy and safe Christmas. May it be filled with joy, peace, laughter and a delicious meal shared with your dearest friends and family. Have a fantastic start to the New Year – see you in 2014! 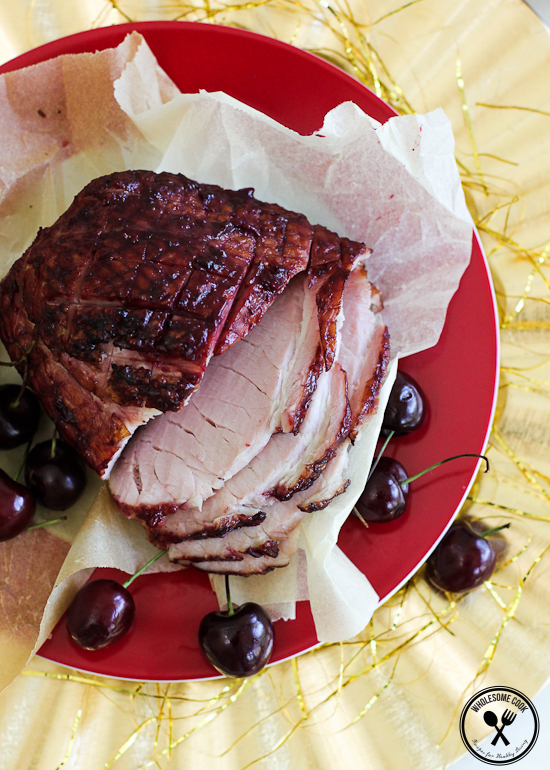 Cherries are a staple at the Aussie Christmas table, so why not incorporate some of them into the Christmas Ham Glaze? Chillies add a nice little heat accent and another flavour dimension, if you like more heat keep a few of the seeds in. This amount will glaze one whole on-the-bone leg ham. Pit cherries if using whole ones. Place all ingredients in a small saucepan and bring to a boil. Reduce heat and simmer over medium heat for 15 minutes, or until most of the liquid has evaporated and the sauce thickened. Process with a stick blender, or transfer to a blender jug and puree. 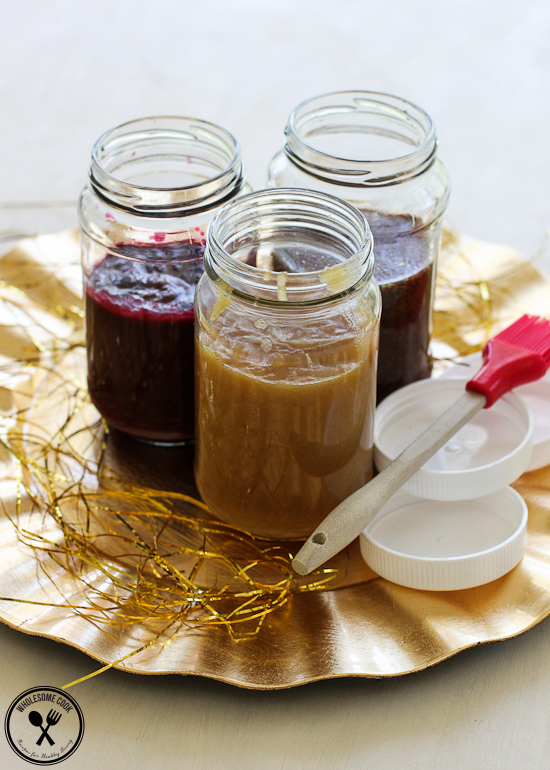 Place in a sterilised jar and allow to cool before placing a lid. Store in the fridge for upto 4 days, or freeze in an ice cube tray for use later. This amount will glaze one whole on-the-bone leg ham. Ham and pineapple go together like apple and crumble, so why not incorporate the pineapple into the ham glaze? This amount will glaze one whole on-the-bone leg ham. While about 1/4 cup of Marmalade could be used in place of oranges, it lends the glaze a bitter flavour from the rind. This amount will glaze one whole on-the-bone leg ham. Oh I like the sound of the cherry glaze! Thanks for sharing and congrats on a fantastic 2013 year. i hope that one of your projects for 2014 is publishing a real paper cookbook. I would love to buy a copy. You are always an inspiration. Merry Christmas tto your family too! You have had a remarkable year, that’s for sure. Congratulations on every bit of it. Well deserved too. Your ham glazes all look good but the cherry really caught my eye. Merry Christmas! your hams look incredible. i love the deep colour of the glaze! I LIKE THE SOUND OF THE SPICY CHERRY!